We have a few blog owners, reporting in Blogger Help Forum: Get Help with an Issue, who are unaware of the AdSense approval process. I was approved for AdSense - but my ads are not showing up. What is wrong? This blog owner is apparently unaware of the two stage AdSense approval process. Eligibility gives a blog owner the ability to place ad code on the blog. Actual ad content will appear later - after the blog has received final approval, and after the AdSense crawler has chosen ads for the blog. 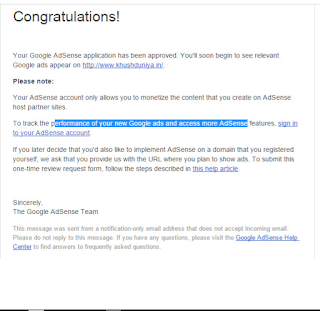 AdSense offers congratulations, when a blog is eligible to apply to host ads. This notice is the beginning, and is based on eligibility to apply. 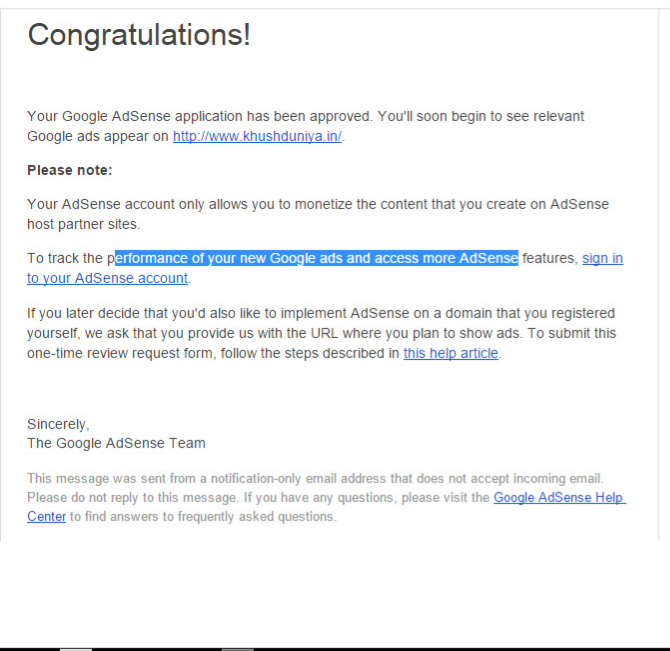 Many blog owners are getting this notice - with blogs completely unsuitable to host AdSense ads. Have you received an approval email saying that your account has been fully approved and ads should start to show on the pages of your site? We have a two-step approval process for all accounts in AdSense. The first step in the process is a preliminary check on your site and your account details. After you pass this step, you get AdSense account access and can place AdSense ad code directly onto your site. The second step in the application process requires that you implement the ad code onto your site. Please note that blank ads will be served at this stage. Once you've started generating ad impressions, your site will be re-reviewed by our specialists. When you're approved at this second and final stage, you'll begin to see live ads appear on your site. I've seen suggestions that email is sent, when final approval for ads is issued. Note that email will be received only if you provided an active and valid email address. "Congratulations" encourages you to install ad code - ads are not a done deal. Congratulations are being received, for some blogs with insufficient content - and others with completely unsuitable content. The blog has insufficient content. Only a dozen posts, none over 200 words each. And, it's another tech blog, with content scraped from other blogs and websites. Also, your command of the English language is not all that good - and this is an important requirement, with AdSense. "Congratulations" is only the start of the activation process. This notice is only part of the AdSense activation process. After ad code is installed, the blog is reviewed for suitability, and the AdSense crawler then chooses ads based on the content. And activation is only a start, to making money. Your blog needs far more content, than what is required for eligibility - or even for having ads appear, on the blog. Don't look for a consistent minimum qualification level, for hosting ads. Some #Blogger blog owners receive a congratulatory AdSense notice - and think that they will immediately be seeing ads, and receiving payments. They do not understand that eligibility to apply only means the start of the approval - and later ad selection - process. And even with ads appearing, they will need more content, to make AdSense a worthwhile blog feature.